Eastern Ontario’s Shootout Series bass tournament organization has announced the signing of an exclusive licensing agreement with FLW to run FLW bass tournaments in Canada. Four anglers will advance from the 2015 Shootout Series Showdown to represent Canada in the 2016 Rayovac FLW Series Championship. Two anglers will compete as pros with FLW providing Ranger boats adorned with the Maple Leaf and two will compete as co-anglers. The top pro award at the Rayovac FLW Series Championship is $95,000, including a Ranger Z518C if the pro is Ranger Cup qualified, and the top co-angler award is a Ranger Z117. The highest finishing pro from the newly introduced International Division at the Rayovac FLW Series Championship will advance to the following year’s Forrest Wood Cup for the chance to compete on the sport’s biggest stage for $500,000 – the biggest payday in bass fishing. 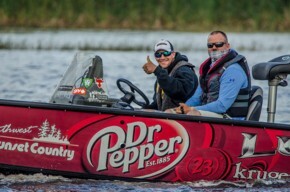 FLW will also provide a Ranger boat for use in the Forrest Wood Cup. “We are excited to work with the Shootout Series to launch FLW tournaments in Canada and give the many great bass anglers to our north a chance to fish their home waters and qualify for the Rayovac FLW Series Championship and ultimately the Forrest Wood Cup,” said Kathy Fennel, FLW President of Operations. Visit the Shootout Series to join FLW Canada and register for your chance to compete for a spot in the Rayovac FLW Series Championship. Your FLW Canada membership comes with full FLW member benefits, including home delivery of FLW Bass Fishing magazine, monthly tackle giveaways and Fantasy Fishing Players Advantage. Anglers must be Canadian citizens to qualify for advancement to the Rayovac FLW Series Championship through FLW Canada.